ST. GEORGE — A storm with several inches of snowfall is forecast to affect a large portion of the state Saturday and Sunday, including parts of Southern Utah and northern Arizona. 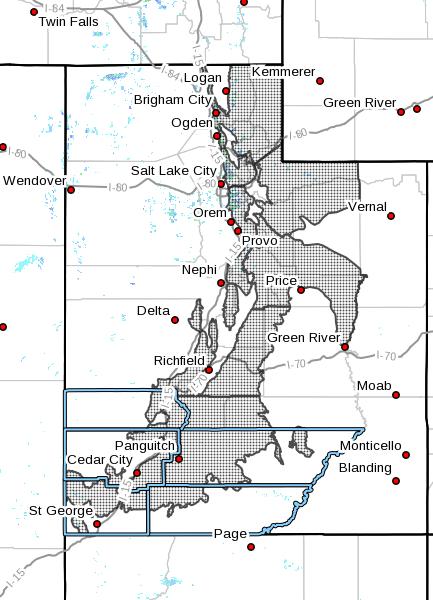 In Utah, the National Service has issued a winter weather advisory in effect from 9 p.m. Saturday to 5 p.m. MST Sunday. In northern Arizona, the winter weather advisory is in effect in effect from 5 p.m. Saturday to 11 a.m. MST Sunday. Regionally affected areas include the central and southern mountains, with some of the heaviest impact in Cove Fort, Panguitch and Bryce Canyon. Areas of Interstate 15 affected fall in northern Washington County, Iron County and Beaver County. Parts of northern Mohave County in Arizona are expected to be affected by winter driving conditions, including a large portion of the Arizona Strip, possibly affecting I-15 toward Mesquite, Nevada. Portions of central and northern Utah are also affected by the winter weather advisory, with Woodruff, Randolph, Alta, Brighton, Mirror Lake Highway, Scofield, Koosharem, Fish Lake and Loa expected to be hit the hardest. In Utah, the winter storm is expected to bring snow with accumulations of 5-9 inches. In Arizona, total snow accumulations of 3-6 inches are expected in areas above 5,500 feet.